What was once Turner Field and the home of the Atlanta Braves (and before that, Centennial Olympic Stadium for the 1996 Atlanta Olympics) has been converted into a state-of-the-art stadium for Georgia State University. GSU Stadium hosted its first football games in the fall of 2017 and also hosts the university's baseball team's home games as well as concerts and other public events. The refurbished venue features one of the largest stadium video boards in the country, a new turf field, a stunning blue and gray locker room, new grandstands in the former baseball stadium's outfield and about 23,000 seats—less than half of what Turner Field had—with the option of adding another 10,000. Braves fans will remember tailgating on the exact spot where Hank Aaron hit his 715th home run and Turner Field, which became a top tourist attraction and a piece of Atlanta history. From 1997, Turner Field was the home ballpark of Major League Baseball's Atlanta Braves. It was named after Ted Turner, who owned the Braves when the stadium was acquired. 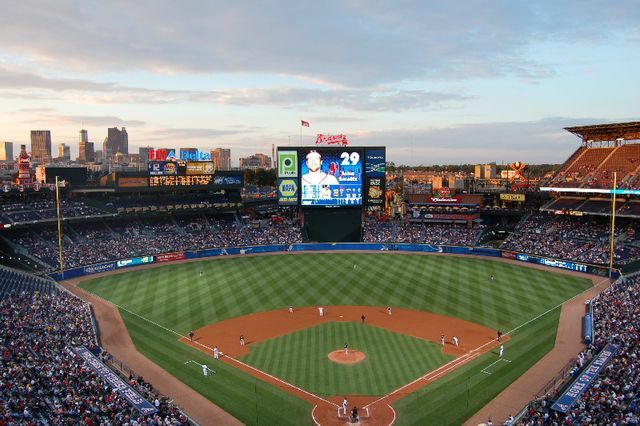 The 2016 season marked the end of the Atlanta Braves’ 18-year run at the city’s beloved baseball stadium, and the team has since moved to the new SunTrust Park. GSU and developers say they also plan to overhaul the neighborhood around GSU Stadium as a vibrant commercial zone. Curbed reports that Georgia Avenue, "stretching from Summerhill to Grant Park, contains...low-rise early 20th-century commercial buildings that will be given a new lease on life," part of a broader plan to "create a new residential and business hub [with new retail and restaurants]...south of downtown, in the parking lots of the former home of the Braves." You could drive your car to GSU Stadium, by why hassle with game-day traffic when you could be dreaming of the game (and after-game fun in the area's new restaurants and bars)? For that, there are two different public transit options, which are outlined below. So grab your peanuts, popcorn and MARTA (Metropolitan Atlanta Rapid Transit Authority) ticket for a game day free of driving and parking. Option 1: For fans who don’t mind walking, we recommend getting to GSU Stadium via MARTA’s Georgia State station. You’ll exit the station on Capital Avenue and walk south for about one mile, which is a 20-25 minute walk. Option 2: There are two bus routes bus routes that will take you to the GSU Stadium. Take MARTA to the Five Points Station, and hop on the 55 bus. Or take the 832 bus from the West End MARTA station. Each route will drop you off within a minute’s walk of GSU Stadium. You can purchase your MARTA ticket online or at any Breeze vending machine. The MARTA fare is $2.50 for a one-way trip, with four free transfers within three hours of purchase, after purchase of a re-loadable $2 Breeze Card or $1 disposable paper ticket. Children under 6 years old ride MARTA free with any adult who has a valid ticket. Parking at any MARTA station is free for less than 24 hours. For more information on fares and schedules, call MARTA at 404-848-5000, go to the online schedule or download the MARTA On the Go app.